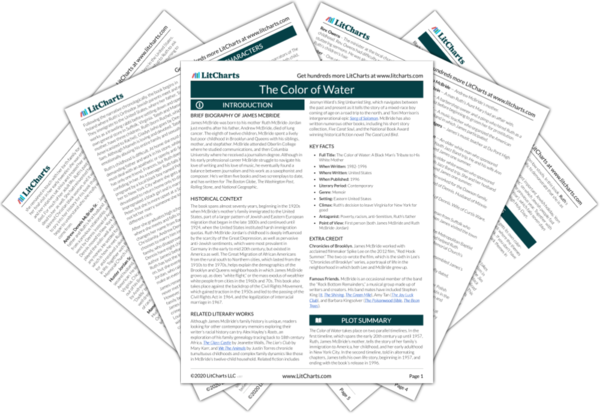 Instant downloads of all 946 LitChart PDFs (including The Color of Water). 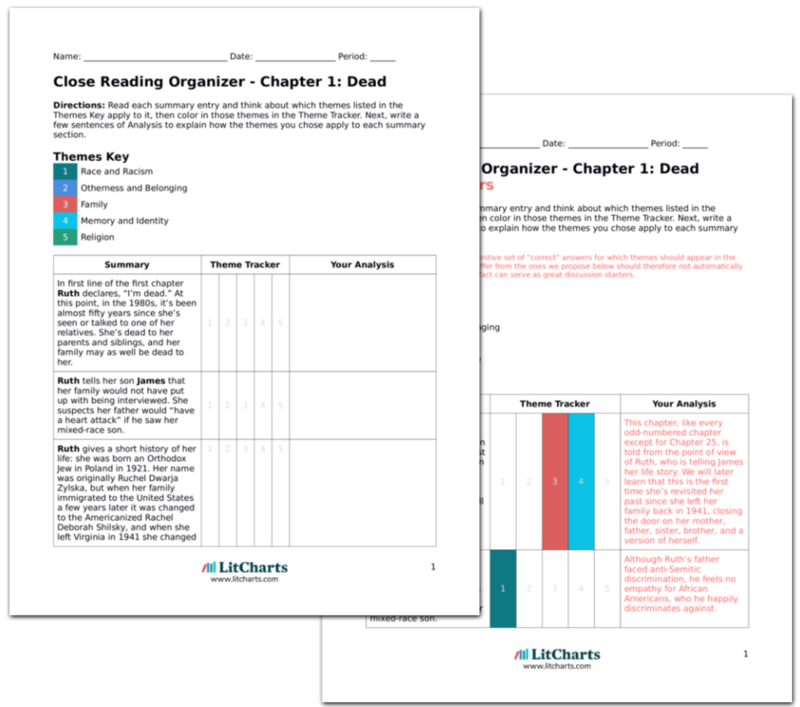 LitCharts assigns a color and icon to each theme in The Color of Water, which you can use to track the themes throughout the work. James narrates this chapter. When he is fourteen his stepfather Hunter Jordan dies, and his mother (Ruth), unable to drive, starts bicycling around the neighborhood. James misses his stepfather, who he thought of as “Daddy,” and who treated Ruth’s eight children from her first marriage like his own. Hunter was seventy-two and seemingly healthy, and his death was a shock to his entire family. Bicycling around town helps Ruth grieve her second husband, whose death reminds her of first husband, Andrew McBride, who died when she was pregnant with James fourteen years earlier. Ruth is only fifty-one, “still slender and pretty,” but uninterested in remarrying, even though it would help her and her twelve children financially. The book’s even-numbered chapters are narrated by James, who writes as an adult reflecting on his childhood. As an adult looking back, James realizes Ruth’s bicycling is a way for her to grieve, something he didn’t understand as a child. James grew up in a mixed household. Although some of his siblings were half-siblings, and his father was his stepfather, Ruth made sure everyone treated everyone else as full blood relations. It didn’t matter how everyone was related, but instead it was important that they stuck together and treated each other well. James reacts to his stepfather’s death by rebelling. He skips class, smokes weed, shoplifts, and steals purses. After a day spent committing petty crimes, James is embarrassed to come home and see his middle-aged mother on her old blue bicycle, which he sees as an indication of how different Ruth is from the other mothers in his neighborhood. As a young teen, James’s stepfather’s death prompts an identity crisis. He acts out because his home, once his only source of comfort and the only place where he really fit in, is no longer a pleasant place to be. As a kid, James is aware that his mother is strange— she’s light skinned, doesn’t have any family, and speaks Yiddish. Because Hunter lives in Brooklyn and only visits on the weekends, Ruth is the “commander in chief” of the family—surgeon, priest, psychologist, and financial advisor—and deals with all major issues, although she refuses to discuss race. Sometimes James wishes his family life was more conventional: a mother and father and only a handful of siblings, like on television. Instead, his mother has created a free-for-all environment that she watches over, stepping in whenever the situation becomes too dire. From an early age James can tell his mother isn’t like the other black mothers in his neighborhood. This begins to bother him, as her confusing identity causes him to question his own, and her evasiveness regarding race just makes him more confused. James just wants to fit in, and while his family provides a safe space for him, he understands that his family is not like many others (because of its chaos, and because of his white mother), which makes him insecure. On his first day of school Ruth walks James to the bus stop. It’s the first time he can remember being alone with his mother, and it quickly becomes a favorite memory. Watching his mother at the bus stop with all of the black mothers in his neighborhood, James sees that she looks more like his white teacher than his black neighbors. When James asks Ruth why she looks different than the other mothers, she doesn’t give a full response. She acknowledges she’s not like the other mothers, but says it shouldn’t matter, and advises James to stick close to his siblings instead of the neighborhood kids. Growing up with eleven siblings, James finds Ruth’s attention at the bus stop to be an incredible gift. However, seeing Ruth next to the mothers of other children is not. James is acutely aware of how he does and does not fit in with his peers, and his clearly white mother makes him and his family stand out. Ruth, however, is unconcerned. After a lifetime of harassment because of her Judaism and her interracial marriages, a few stares at the bus stop do not faze her. 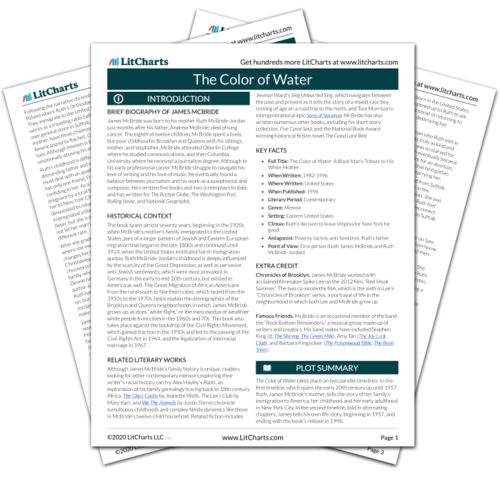 Get the entire The Color of Water LitChart as a printable PDF. A few weeks later, James gets off the bus and panics when he realizes Ruth isn’t there to meet him. He waits and waits until all the other children have left with their parents, until he finally sees all of his siblings running towards him in a ragtag group, ready to pick him up from the bus. James’s siblings are his community and his support system. Ruth has done her best to teach her children that they cannot fully trust anyone but each other, and they must be there for each other in her absence, because no one else can be relied upon. Sanders-Schneider, Ivy. "The Color of Water Chapter 2: The Bicycle." LitCharts. LitCharts LLC, 9 Nov 2017. Web. 24 Apr 2019. Sanders-Schneider, Ivy. "The Color of Water Chapter 2: The Bicycle." LitCharts LLC, November 9, 2017. Retrieved April 24, 2019. https://www.litcharts.com/lit/the-color-of-water/chapter-2-the-bicycle.